Nothing is worse than a frigid snow storm to inconvenience a motorcyclists to purchase a full-coverage helmet. Snow pelting your face at 65 mph, is not a feeling you want to experience. A full-coverage face-shield on an open-face helmet will block the snow, but you run the risk of having more water droplets drip onto your face. You also want to be sure to stay warm and dry. When you become wet and cold your mind begins to doze, reducing the mental awareness you need to stay alert on the road. Once you’re dressed appropriately, you now need to focus on traction. No matter what, if ice starts forming on the road or there’s a wintry snow / ice mix, you want to be sure to get off the road. 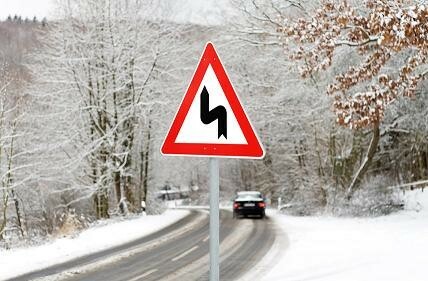 If you slip or another car slips, you run the risk of facing personal injuries—and there is no four-wheel drive that will protect you or other drivers from slipping on ice. Assuming you know how much deceleration you can develop on dry pavement before the rear tire breaks loose, you have a gauge of what’s available if you repeat the test when the road is covered with snow. This also assumes that you have a reasonable amount (say 3/16 of an inch) of tread depth. If you do this at moderate speeds on a flat, straight road, it won’t become a thrill ride. Avoid locking up the rear wheel on a steeply crowned road, where it will tend to slide downhill and out of line. You also can do a couple of things to improve traction. Premium aftermarket tires are virtually certain to give better wet-road grip than original-equipment tires. Also, a slight increase in tire pressure also improves the wet-weather traction of any tire.